Addis Ababa, 7th May, 2018 - The Department of Trade and Industry is organizing the Dedicated Session of the African Continental Free Trade Area Negotiating Forum and Legal Experts from 30 April – 12 May, 2018 in Addis Ababa, Ethiopia. The objective of the Meeting is to undertake Legal Scrubbing of the Annexes to the Protocol on Trade in Goods, and the Annexes to the Protocol on the Rules and Procedures on the Settlement of Disputes. Participants are also required to consider and recommend for adoption by the African Union Ministers of Trade, the list of Priority Sectors on Trade in Services. They are further required to consider outstanding issues on Modalities for Tariff Liberalization, including Criteria for Designating Sensitive Products and Exclusion Lists. The Meeting is being attended by members of the AfCFTA Negotiating Forum and Legal Experts from Member States. Trade Experts from the eight RECs recognised by the African Union (CEN-SAD, COMESA, EAC, ECCAS, ECOWAS, IGAD, SADC and UMA), Experts from AfDB, UNECA and UNCTAD. In a statement sent to participants and read by Mr. Karidio Hamadou, Director of Foreign Trade and Economic Partnership and Chief Negotiator of Niger, H.E. Mahamadou Issoufou, President of the Republic of Niger and Champion of the AfCFTA process, commended Chief Negotiators for their availability and determination. He indicated that March 21, 2018 will remain engraved in the annals of history as the starting point of the conquest for the economic independence of Africa. “By making available to the African peoples the Agreement on the AfCFTA and its protocols, you have offered Africa the opportunity to show that it will henceforth speak with one voice in the concert of nations”. He urged participants to keep the momentum and called on them to see the overall benefit of creating an integrated, prosperous and peaceful Africa, the Africa we want as stated in Agenda 2063. In the same vein, the Commissioner for Trade and Industry of the African Union, H.E. Amb. Albert M. Muchanga, congratulated Chief Negotiators for the historic achievement. He pointed out that the Kigali Extraordinary Summit is marked as a landmark in African economic history. “We are welcoming the concrete beginning of the journey to create one African market. We are saying goodbye to the era of small, isolated and fragmented small markets. We are clearly signaling that Africa is not for isolationism or nationalism. Our message to ourselves and to the rest of the world is that we pool our independence and sovereignty to create a higher value of inter-dependency anchored on creating one African Market” he underscored. The Commissioner recalled the objectives of the Meeting and called on Member States to deliver the minimum 22 ratifications within 9-12 months from March this year so that the legal instruments establishing African Continental Free Trade Area come into force. 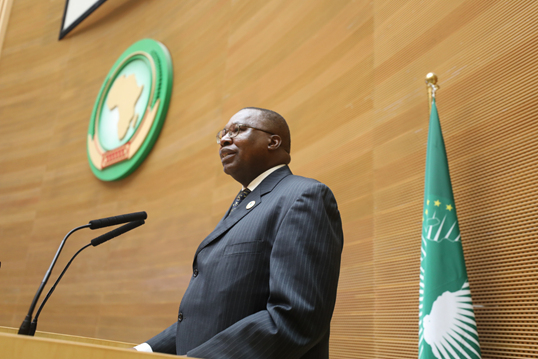 He indicated that Rwanda, Ghana and Kenya have led the way for the AfCFTA’s ratification and urged other Member States to deposit instruments of ratification so that the African Union Commission can have an official record of ratifications. The Dedicated Session of the African Continental Free Trade Area Negotiating Forum will be followed by Senior Trade Officials and African Union Ministers of Trade (AMOT) meetings planned to take place from 25th May to 2nd June 2018, in Dakar, Senegal.